Snapshot Kinship Inference provides highly accurate inferences about the familial relationship between two people based on their DNA, even if they are distantly related. Unlike traditional forensic DNA methods, which are extremely limited in their ability to determine kinship (see tan region in the figure below), Snapshot can detect relatedness out to 9th-degree relatives (fourth cousins). This powerful forensic analysis tool gives investigators valuable, previously unobtainable information about the DNA samples found at a crime scene — information that can save time and money and lead to more solved cases. Thanks to the massive amount of information contained in genome-wide SNP data, using DNA extracted from two biological samples, it is possible to precisely calculate the degree of relatedness between the contributors, even if the relationship is very distant. 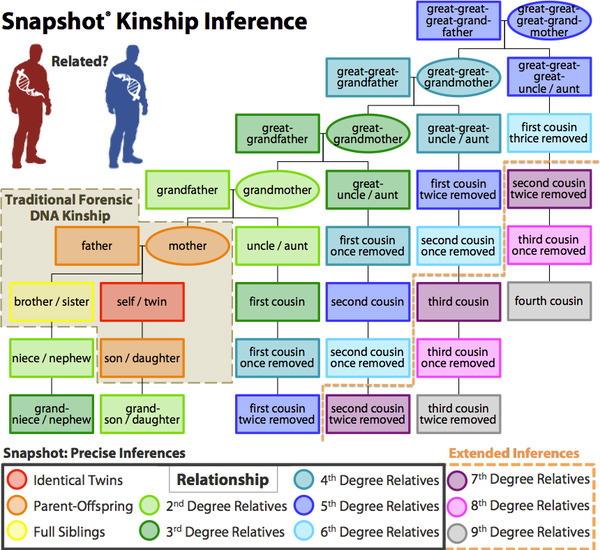 Built with advanced machine learning algorithms, the Snapshot kinship model can distinguish up to 9th-degree relatives (fourth cousins) from unrelated pairs. Traditional STR-based kinship analysis is limited to distinguishing parent/offspring relationships, often yielding inconclusive results for siblings or other second-degree relatives. Snapshot's kinship model, on the other hand, uses hundreds of thousands of SNPs to detect relatedness out to 9th-degree relationships — e.g., fourth cousins. Moreover, the precise degree of the relationship can be determined out to 6th-degree relatives (second cousins once removed) while minimizing false positives — i.e., unrelated pairs mistakenly inferred to be related. Traditional autosomal kinship analysis uses fewer than 20 short tandem repeat (STR) loci, which lack the resolution to establish relatedness beyond parent-offspring or full siblings, and is easily confounded by mutation or mistaken testing of a close relative of the true parent.1 Other forensic analyses use pieces of DNA that are directly transmitted through the maternal (mitochondrial DNA) or paternal (Y-chromosome) lines; however, these approaches are limited to a small subset of relationships and have very low resolution. For example, ~7% of unrelated Europeans share the same mitochondrial haplotype, meanting that they cannot be assigned to a specific family. MtDNA and Y-STRs can only suggest that two individuals may be related but cannot say whether that relationship is close or very distant. Dissatisfied with these limitations, Parabon's scientists sat out to develop a novel algorithm that takes advantage of the massive amount of autosomal data made available by genome-wide SNP typing to compare two genomes and determine the precise degree of relatedness between the two individuals. The result is a revolutionary new test that redefines the state-of-the-art in kinship analysis. Parabon's kinship algorithm analyzes the similarity between two genomes and uses a machine learning model to predict the degree of relatedness of the two individuals. In thousands of out-of-sample predictions, this method has proven to be highly accurate while maintaining a very low false-positive rate (i.e., unrelated pairs are almost never mistakenly inferred to be related). This is true across subjects from a range of ethnic backgrounds, including related pairs with different ethnic backgrounds. Absolute accuracy is >90% out to 3rd-degree relatives (first cousins), and Snapshot can distinguish 6th-degree relatives (e.g., second cousins once removed) from unrelated pairs with greater than 98% accuracy. Snapshot Kinship Accuracy, measured as the frequency of correct predictions of the exact degree of relatedness (absolute accuracy) and the frequency of predictions within one degree of actual relatedness (n = 3,654 relationships). As shown in the figure above, even when Snapshot incorrectly infers the degree of relatedness between two individuals, it is almost always correct within one degree. For example, Snapshot may occasionally incorrectly predict a 4th-degree relationship to be a 5th-degree relationship, but it rarely makes the mistake of predicting a 4th-degree relationship to be a 6th-degree relationship. With this level of accuracy, you can be confident that the inferences provided by Snapshot are reliable and actionable. Chakraborty, R., et al. (1999). The utility of short tandem repeat loci beyond human identification: implications for development of new DNA typing systems. Electrophoresis, 1682–1696. If there is a chance that the perpetrator of a crime is related to the victim, Snapshot can compare the victim's DNA to a crime scene DNA sample to determine whether they are related. With just one test, investigators and include or exclude the entire extended biological family of the victim. If DNA from a suspect cannot be obtained, but a consenting family member is willing to contribute a sample, Snapshot can establish whether that family member is related to a crime scene DNA sample. If the identity of unidentified remains is suspected, but only distant relatives are available, Snapshot can compare DNA from the remains (even bone) to that of a relative to determine whether they are related. Morgan R. and Kena G., Criminal Victimization, 2016, US Department of Justice, Office of Justice Programs, Bureau of Justice Statistics, NCJ 251150, Dec 2017. https://www.bjs.gov/content/pub/pdf/cv16.pdf. Retrieved: 19 Feb 2018.